21st July 14: Weather in Bali has really become cool! The students are wishing for more rains and looking forward to a rainy holiday! The School Campus has magically turned green! Fresh grass has cropped up; trees look washed and greener; students crave to sit outside and study! Lowest temperature was 26°C, while highest was 35°C and humidity is 85%. The whole week sky was filled with nimbus clouds, threatening to rain! 4th July 14: Krystal Sung an LC student visited the school to meet the students and spend two days on the campus raising awareness for water preservation. We are extremely thankful to her for raising $4000 to help the school install an RO plant under her Girl Scout Gold Award project. During her stay she interacted with the students to brief students about her project and how she has been successful. She organized activities in Junior School. Krystal did a session on water with the students of the Eco Club and inspired them to take up social work in rural area to help people live better lives. Krystal and her father visited the forest with Class XII students to see the water reservoir which is filled with the water now. It is indeed our pleasure to thank Krystal for the work she has done for us. We wish her good luck for her future and hope she gets a gold medal soon. Mr. Sung, Krystal’s father took up a session each with Class XI and XII to throw light on avenues open for students in Geology. He himself is a geologist and wished our students could take up this as a profession. He was of the opinion that this is one way in which you know your country best. With commerce students he spoke of the big time money that they can make if they take up a profession in geology. 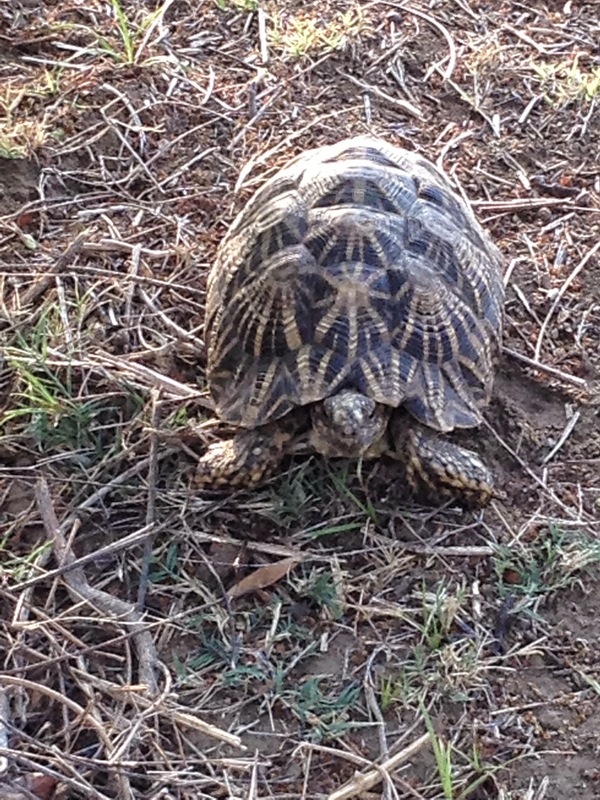 It was a huge surprise to see a lone tortoise roaming freely on the campus. He had to sadly return to his home in the jungle as all students were inquisitive to take a peek at its head and movement. 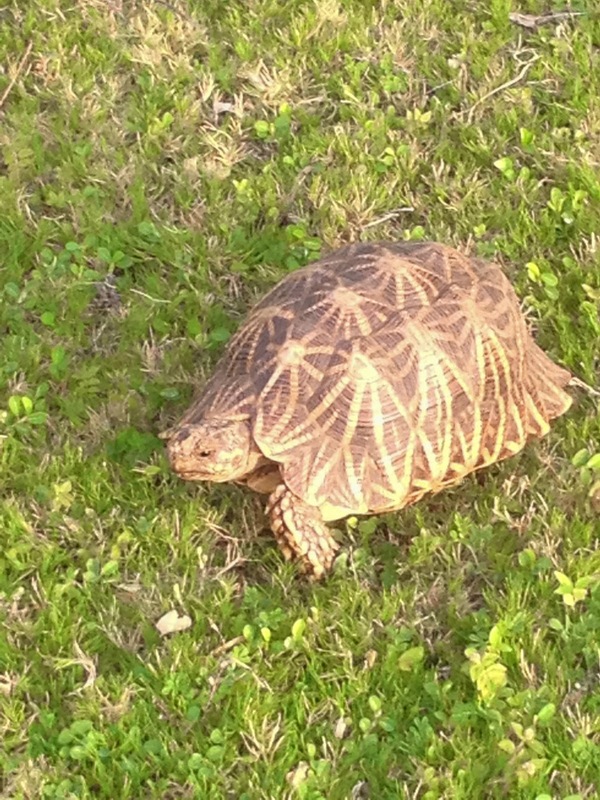 Students could then watch it trudge back to its home! 25th July 14: School organized a friendly volleyball match students and staff with Krystal in the evening followed by dinner. The match was played in four groups. Girl versus lady teachers and male teachers versus Class XII boys. Gents staff and Class XII boys played two matches and students won by 2-0! The Fabindia School played a friendly cricket match with Kanakraj Sawantraj Lodha School. Unexpected showers interrupted the match. Only the Lodha Team batted and made 26 runs in 4 overs with 3 wickets. The hosts Lodha School looked after us very well, thanks to Lodha School! Both the teams have promised to meet again to play a memorable match. DEAR Program is catching pace slowly and steadily. Classroom Libraries are in the offing for Classes I and II. This will help students to do story telling in the class itself. 26th July 14: Saturday saw a regular activity day. Hindi Essay Writing Competition was organised for students of Class III to X. About fifty students participated in the competition. 14th July 14: Monsoon has arrived. The whole week Bali experienced rains during night and sunshine during day. The School Campus was seen filled with water. School buses have changed route due to the broken bridge at the entrance of the school road. Students have been enjoying outdoor activities due the weather. Lowest temperature was 32°C and humidity is 59%. Studies have at last fallen in place. Teachers have started conducting class tests in their respective classes. Giving homework has been cut short so that students are not burdened. A schedule has been made with allotted days for all subjects. Mathematics homework will be given daily. Primary classes will get homework for 15 minutes, while senior section will get for 30 minutes. In order to make DEAR program a success and create interest for students in reading, arrangements have been made to provide storybooks in the classrooms for Primary section. 17th July 14: Eco Club was formed. Six students from each class are members of the club. Since the school is going to apply for the Green certificate. Eco Club is going to work to get projects rolling- these include clean school, saving water, switching off fans and lights when not required. Mamta Chouhan has been elected the Secretary and Kushi Rao the Joint Secretary of the club. Teachers heading this club are Ms. Prerna Rathod and Mr. Dinesh Bharti. 18th July 14: A friendly match of football was organized for the students of class VI and VII. Class VII were the winners. 19th July 14: Saturday saw a regular activity day. Essay-Writing Competition is being organized on National Level and our students have been encouraged to participate in it. Teachers brain stormed the topic with their students after Assembly. They discussed ‘Relevance of Anuvrat in student’ life’; ‘To thine own self be true’ (Shakespeare). Mr. Dinesh Kumar Bajpai programming officer of the Caring Souls Foundation visited the school today. He addressed Class VI to XII students. Mr. Bajpai spoke on maintaining habits in one’ student life to save one’s self from cancer. He stressed upon the usefulness of a disciplined life. Eating patiently, walking and being active in one’s life, avoiding using cheap perfumes, avoiding using cell phones to type and hear, use landline more than a mobile were certain disciplines that he stressed upon. He has left certain instructions for parents and teachers that will be related to parents in PTM. Most interesting fact to know was that CANCER is interpreted as CAN SERVIVE! He advised all to keep happy and cheerful all the time because this creates red blood cells in one’s body. This helps Cancer at bay! The English Readiness Programme with its module is ready. Hindi Readiness Program will commence from Monday, 29th July. ERP will be implemented from Monday by the English teachers during the Remedial classes. The program is a series of modules with worksheets and activities of reading. It is hoped that students will highly benefit in developing English spoken skills. A very big thanks to our Principal Ms. Deepika Tandon who alone has done all the hard work to prepare the modules for this program, keeping our students’ level of English in mind. Local Managing Committee met to catch up with school progress. Principal read out reports on Scholarships, Campus Development, PTM and Annual Function. Attendees were appreciative of the gradual progress at school. The committee was concerned to have the school main road built for which the Chairman advised that a request letter be sent to the municipal so that the process starts. School water harvesting reservoir is filled with water in the first showers. Please take a look! 7th July 14: Rains are here. Monsoon has arrived. The happiness can be felt in the high pitched tones of students and their wish to study outside the class! Lowest temperature was 35°C and the humidity is 59%. Sudden bursts of showers drenched the whole Bali. Fields could be seen filled with rain water. DEAR has fallen in place but teachers are still struggling to create interest in students. In order to help create this story telling will be part of DEAR for Classes I to III. The Campus this week was overcrowded with parents visiting the Admin Block to deposit fee, admissions and buy uniforms. Big thanks to the Admin staff who handled everything with ease, especially Mr. Bharat Ojha for his patience with such demanding parents. 10th July 14: A workshop was conducted by Ms. Anez Katre from Doon School. Anez has established Doon School’s Teacher Training Centre. She came to assess areas of learning among teachers, which will help her further plan training modules. She conducted activities that entailed creating emerging student profile of TFS and then creating need based training requirement for teachers that would help to create such students out of TFS. Once she receives these suggestions, she will return in December to build this further. 12th July 14: Saturday saw regular activity day with a new introduction to embroidery classes for girls of Class VI to XI. A Disciplinary Committee has been formed with six members: Mr Atul Bhatt the chairperson and members as Mr. Surrender Singh (representing sports section), Ms. Prerna Rathod (representing Middle Section), Ms. Raj Ranawat (representing Senior Section) and Ms. Kavitha Devda (representing Pastoral Care) in it. They had their first meeting, where they discussed students who had been under the scanner for indiscipline for some times now. This committee will be responsible to create reformatory ways for its students and parameters for improvement. Committee’s decision will be deemed final. We are very thankful to our donors and supporters who help us to make the scholarship program a great success and support us to offer affordable quality education in English medium to the people of Bali! The BAT Website (www.bateducation.org) has the update about the scholarships programme. 1st July 14: Welcome back readers! School reopened on 1st July'14. Campus once again buzzed with activity. This time it was new classes, new teachers and of course newly painted classrooms! So, excited students could be seen trying to figure out their classrooms; exchanging information on their visits to hill stations or relatives and finding new additions to their campus. All in all every single student looked fresh and cheerful; ready for a new term! Weather in Bali has become a wee bit pleasant, due to cloud presence and showers in the surrounding areas. Monsoon is ultimately here! Temperature is 39°C and humidity is 36%. 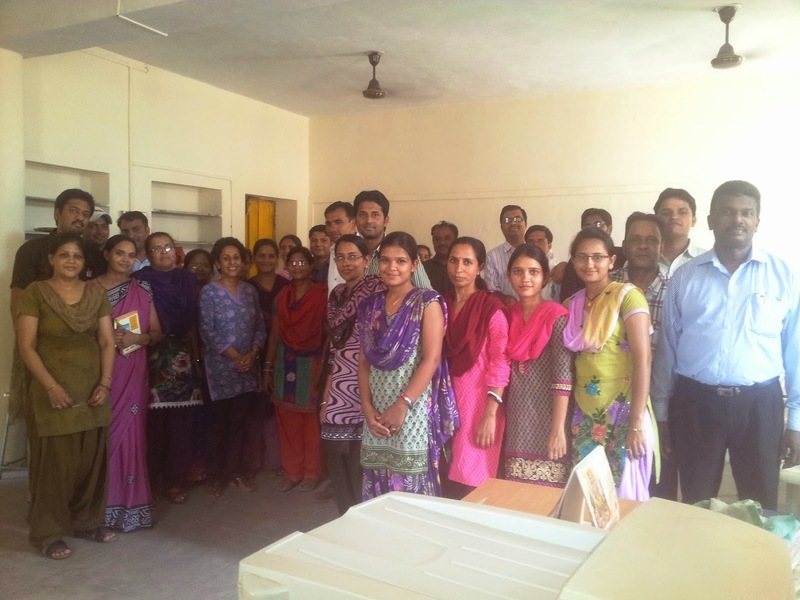 We welcome the new staff who has joined The Fabindia School family. Mr. Ajay Vijayvargi for Science and Math; Mrs. Sharmila Vijayvargi for Primary classes and Mr. Sarvar Khan our new PTI have joined from Tuesday, 1st July 2014. School has started a new facility for students, called Remedial. This session will help average and above average students to improve in their studies. Remedial is a session of one and a half hours that will deal with basic knowledge of each subject. Teachers will take up basic lessons in subjects so as to develop concepts for students who are average and take up more challenging lessons for those who are above average to increase their level of performance. This will specially help with better understanding in the classroom. In order to give this facility to students school’s new timings from 7:30 AM to 2:30 PM with two breaks, one a fruit break at 9:50 AM and the second one a lunch break at 11:20 AM. A new niche has been created for primary section behind Block 5. Old labs existed in this block. Hence, slabs of these labs were used to make benches in this little area for Primary section. Now there is more space in classrooms as well. The area is being developed for outdoor class activities and an area where teachers can have lunch with their students and teach them table manners or enjoy class picnics. Class activities have already started here from day one! Such was the welcome change! The area will be developed with flower beds and a separate washroom for this wing so that the little ones don’t have to walk all the way to Block 1. Teachers were found saying “What a relief!” “Vow” “I am happy” on spotting this little space that has been created for their students. Elections for Staff Club and Staff Representative were held during summer training. We would like to congratulate Mr. Dinesh Bharti as the Secretary for Staff Club and Ms. Sonal Punmiya for being elected for Staff Secretary. 5th July 14: Saturday activities were carried out in all the classes from Class I to IX. Class X to XII attended regular classes. Inter House Football tournament was organized. First match was played between Rani Laxmibai House and Chanakya House. Second match was played between Pratap House and Shivaji House. Rani Laxmibai House won the match while Shivaji House was the runner up. We are thankful to Mr. Sandeep Dutt for donating camera, video cameras to help us run the Photography Club; books for the library and the club; label printer and barcode scanner for Admin Office. Compiled by Bharti Rao for The Fabindia School. Thanks to our Principal Ms Deepika Tandon for her support.